It’s difficult to choose among the many brands, types, sizes, and prices of burr grinders. If you’ve never owned one, they’ll probably all look the same with some slight design differences. We've touched on these models in our coffee grinder reviews, but this model comparison digs deeper. In this guide, you will get a closer look into two burr grinders, the Capresso 565.05 Infinity and the Baratza Encore. Which one should you buy? The following is what I learned. The Capresso Infinity is lauded as a good grinder for larger quantities of coffee, with a commercial-grade Infinity grinder that holds 8-1/2 ounces of beans. A built-in timer that sets the grind time anywhere between five and 60 seconds. This means you don’t have to stand and press a button constantly to finish your grinding. An advanced conical burr design that is made of steel and typically found on commercial grinders. A burr design that slows down the gears to reduce the amount of friction and heat and preserve the flavor and aroma of the beans. An easy cleaning process. The bean container and upper burr lift to allow for cleaning the grinding chamber. A brush is included for this purpose. 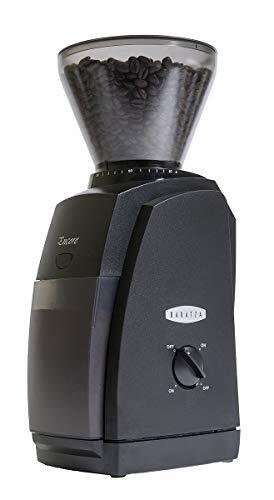 The Baratza Encore is a great all-around home grinder that allows you to explore an extensive range of coarseness of beans, which in turn allows you to experiment with different types of brews and methods of brewing your coffee. Forty individual grind settings, from fine to coarse, providing grinds for drip and manual brew right through to espresso. A DC motor that keeps beans cool, even during extended grind times. Uses a combination of gear and electronic speed reduction that ensures a smooth bean feed with reduced noise and heat. A front-mounted button that allows you to grind right into a brew basket. Durable conical burrs, which produce consistent grinds and stay sharp for many years. A design that minimizes the amount of coffee left in the grinder. Grinders that can be user-calibrated. A second-generation Gearbox design that increased the strength and durability of the drive transmission and decreased the noise. The Capresso is equipped with a commercial-grade Infinity grinder, featuring an advanced conical burr design made of steel. This gear reduction motor grinds slow, reducing the amount of friction and noise, providing little static build-up in the grinds, and preserving the beans’ flavor and aroma. This is especially important for the best Kona coffee which costs more and requires delicate grinding. The Capresso features 16 different settings, and they are organized into four settings in each of four categories. This may be easier to use than other grinders, in that you can choose extra fine, fine, medium, or coarse, and then choose one of four settings within each of those categories. It may be less overwhelming than having a huge number of settings from which to choose. This way, if you know that you need a specific coarseness for a specific method of brewing, for instance, a fine grind for espresso, you have a starting point, and you can then experiment within that category. The finest setting is also apparently ideal for preparing Turkish coffee, which Capresso claims is rare in a grinder. The Infinity also has a built-in timer that runs anywhere from 5 to 60 seconds, so you can turn it on to grind, then walk away and do something else (get out your cup, or the cream and sugar!) while the beans grind. On the other hand, the Baratza has 40 settings, adjustable from fine for espresso, to medium for drip brewers, to coarse for French Press brewers. The settings are accurate and repeatable and will allow you to explore a lot of brew methods, and coarseness of grind within each method you choose. If numbers make a difference to you, the grind range is listed as being from 250 to 1200 microns. It also has a burr calibration system, which ensures that each grinder has the full range of grind, but also allows the user to calibrate the grinders if necessary. The Baratza Encore also has unique speed control. The rotation of the burr is controlled at 450 RPM, but if users require a specific speed or modification to the existing speed setting, the controller is adjustable from 405 to 495 RPM. The slow speed of the DC motor reduces heat, noise, and the generation of static in the grinder. In 2012, Baratza introduced the second generation of its motor, Gearbox or GB 2.0, which it claims significantly increased the strength and durability of the drive transmission, while also decreasing noise. Both machines feature conical burrs, which are great for producing consistent grinds but are also very durable and will remain sharp for years to come. The Capresso machine sits almost 11 inches high and weighs about 3 pounds. The capacity of the bean container is 8.5 ounces, and the container for the grounds is 4 ounces. The coffee grind container remains sealed during grinding, and to ensure safety, the bean container also needs to be locked into place for the Infinity to operate. The grinder has a heavy-duty zinc die-cast housing, but the hopper and bin are made of plastic so you may want to be careful with how you handle them. The bean hopper is see-through and so is the grounds holder. The Baratza Encore sits about 14 inches high. It has a bean hopper capacity of 8 ounces, and the bin for the grounds is 5 ounces. It weighs about 7 pounds. To ensure maximum freshness, there is a minimal amount of ground coffee left in the grinder after emptying. The bean hopper is clear, but the grounds holder is somewhat opaque. They are also both plastic. Both machines come apart for cleaning. Their bean hoppers and grounds holders come off to enable cleaning. The Capresso comes with a cleaning brush. Its bean container and upper burr lift off to allow you to clean the grinding chamber with the brush. You can also then wipe down the housing. Make sure the bean container is empty before removing it from the base. If you don’t, your beans will fly around. The Baratza’s burrs are easily removable with no tools, making cleaning very easy. One interesting tip for any coffee grinder – run some rice through your grinder to completely clean it of any coffee bean residue, if you want to ensure you don’t mix two kinds of beans. 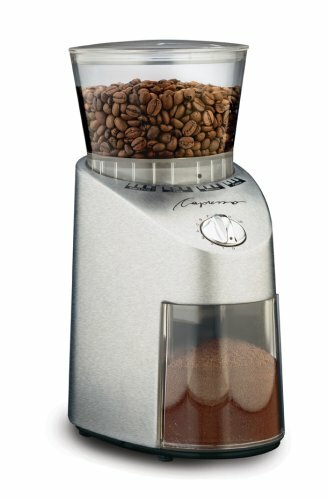 With the Capresso’s Infinity Burr Grinder, you place the beans in the hopper and then turn the hopper to the desired setting. The four “categories” of settings (extra fine, fine, medium and coarse) are on the front of the grinder, and you turn the hopper to one of four settings within each category. The on-off dial is on the front of the grinder. The Capresso includes a safety feature in that it will only grind when the black dot on the bean container points to one of the settings. Then you can turn the timer and grinding will begin. But if you turn the bean container marking (a black dot) outside of the settings, grinding will stop. It’s important to ensure that black dot doesn’t rub off with use, or you will have trouble knowing when you can run the machine. The Baratza’s 40 settings are also set by turning the bean hopper. The on-off switch is on the side, and there is a convenient pulse button on the front. As mentioned previously, the Baratza has a feature that allows you to grind directly into your brew basket. With the Baratza, there is also the option of buying accessories. One is an extension to the bean hopper. This will add 9 ounces of capacity to the already existing 8 ounces. If needed, several extenders can be added. The other is what they call an “Esatto.” This turns the Encore into a grind-by-weight grinder. You simply select the weight of grinds you want, and the Esatto will weigh the ground coffee to within plus or minus .2 grams, according to the company. This is done while grinding and then the machine stops automatically when it reaches the desired weight. Some factors differentiate these grinders, and some of these factors may be important to you. First, if color matters or you want to match décor, the Capresso Infinity is stainless steel, and the Baratza Encore is black. If having many settings to be able to get to an exact grind is important to you, the Baratza may be your choice with its 40 settings. For ease of use, the 16 settings of the Capresso may be preferred. When using it, you simply turn it to one of the four categories and then choose one of four coarseness options within that category. If the accessories of the Baratza appeal to you, this may be a factor in your decision. Perhaps you’re not sure if you want those options but like the idea that you can buy them in the future. You will have to factor in the additional cost when making that decision. Whichever you choose, you will have a good quality coffee grinder that will fit with whatever type of brewing system you have, and help you achieve that barista cup of coffee in your own home.